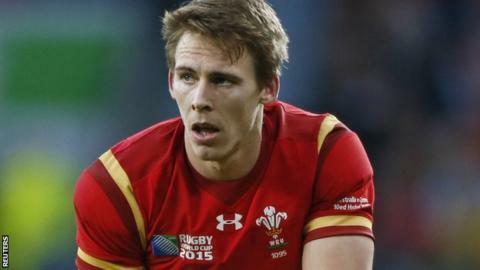 Wales full-back Liam Williams will train with the Scarlets squad next week and remains on course to face Connacht on 30 January. Williams has not played since he suffered a foot injury during the World Cup. The 24-year-old is due to return to action just eight days before Wales begin their Six Nations campaign in Ireland on 7 February. "It's exciting times, he's not too far away," Scarlets coach Wayne Pivac said. "He's moving well and he's going to be training with the team and not doing his rehab." Scotland flanker John Barclay will miss Sunday's European Champions Cup game away to Racing 92 with an arm injury. Lock Lewis Rawlins is also out with a shoulder and neck problem, but Wales scrum-half Gareth Davies is back after illness ruled him out of the Pro12 win over Connacht. Phillips, 19, is fit again after suffering concussion in the Champions Cup defeat against Glasgow Warriors on 12 December. Scarlets are out of contention in Europe after four defeats, but still top the Pro12 despite two derby defeats over the Christmas period. But Pivac says they will not have the luxury of resting players during the Champions Cup fixtures against Racing and Northampton because of their injury list. "Unfortunately the number we had to start with has been heavily reduced so we don't have a lot of options," Pivac added. "We know where exactly we're at in this competition so it's really what we want to get out of the game. "It's a great opportunity for individuals to stand up on a pretty big stage and perform."